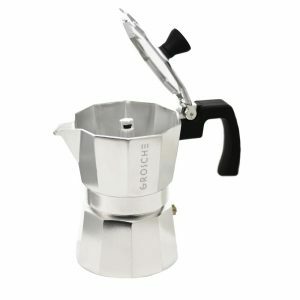 A classic Italian stovetop espresso maker made from durable aluminium. Available in 3 sizes. 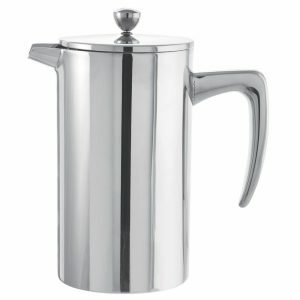 The MILANO from GROSCHE is a classic Italian stovetop espresso maker, also called Moka pot. It’s perfect for anyone who loves the taste of a strong shot or double shot of espresso. Compared to filter coffee makers, this brewing method extracts more caffeine and flavours. This gives stovetop espresso a stronger and richer brew than a percolator. The MILANO stovetop espresso maker will make your espresso experience perfect every time. The MILANO Moka pot is made from food safe aluminium a non-toxic silicon gasket seal. You can use it on all gas and electric stovetops, it is however not suitable for induction stovetops. The MILANO is the only coffee percolator that features a burn guard on the grip to protect your fingers from touching hot surfaces. In addition, it also features a ‘Made in Italy’ certified safety valve that prevents internal pressure from increasing to a dangerous point. The handle of the Milano moka coffee maker is soft to touch. It also features a burn guard to protect your finger from accidentally touching a hot pot. And its spaced away from the pot body to reduce the chance of over heating. The Milano moka pot coffee maker is made from the finest food grade EN301 Aluminium. It is high polished for a natural sheen. Also, the threads that connect the top and bottom are made for a tight seal and long life. Safety is the most important part of making moka coffee. Each pot is a pressure vessel and shoudl be handled with care. Thats why we only use Italian Safety relief valves in the Milano moka espresso makers. Their love of coffee is something that Italians are known for. 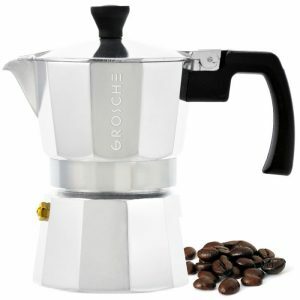 In Italy, the most popular way of brewing coffee is in a Italian stovetop espresso maker or Moka pot. While espresso that is purchased in a cafe here is often made in a high pressure machine that runs at around 15 bars of pressure, stovetop espresso makers work with low pressure. They say the older these pots are, the better they work. They can last a lifetime with proper care. Always hand wash them, and never put them in the dishwasher. In a dishwasher the aluminium will tarnish and turn black. Every 3-6 months or so you should consider changing the silicone seal that is in the pots and the one that maintains pressure in the boiler section to brew the fine ground coffee. 3 cup is 150 ml or 5 fl. oz. 6 cup is 275 ml or 9.3 fl. oz. 9 cup is 450 ml or 15.2 fl. oz. How to use an Italian Coffee maker? Read out blog article to learn how to use a moka pot in detail. Its easier than you think. CONDITION NOTE: This is a new item with damaged or missing packaging.